The es8 recorder uses a Compact Flash memory card for recording. A stand-alone operation with the LCD and the key allows you to set, monitor, and record. By connecting to a PC with a built-in USB interface, you can perform the wave monitor and the recording control. While simultaneously sampling on all channels, using the 16 bits A/D converter individually equipped in each channel, approximately four hours of continuous recording can be done with an internal dry cell battery., An external battery will extend recording time. The sampling frequency ranges are 5kHz to 1/60Hz. Combining with various types of sensor amplifiers, a wide range of measurement is possible such as; earthquake, natural phenomenon and structural vibration, mechanical vibration measurement of the strain measurement, and bio-signal measurement. Low cost data recorder for vibration measurement and an 8 channel AD converter with a USB interface for laboratory use. 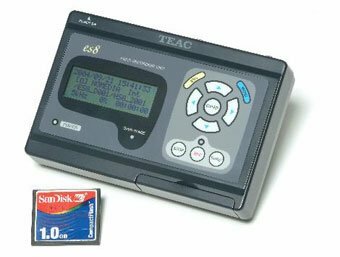 Supported CF Card recording data formats are CSV, and TAFFmat (TEAC standard format consisting with a text header file and a binary data file). 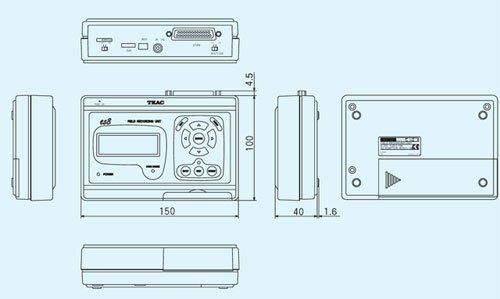 In addition to the manual operations such as Start or Stop, a various automatic measurement modes are also included such as; Level Trigger (Edge detection), Window Trigger, Pre/Post Trigger, and interval recording. With a built-in comparator output, the recorder can be used to monitor usage by generating an external alarm. Operates within the wide range of operating temperatures, －10°C to 50°C. 8 channels. Individually ON/OFF selectable.